Performance Time: Approximately 45-60 minutes, 45 pgs. COLLECTION. There’s a world of hilariously “evil” people in this provocative collection of four short plays. In “Perceptions,” a mother treats her grown son like a baby...literally. In “Easy Flavors,” a stranger arrives in a town where everything proves to be too easy. In “Train Station,” a man waiting for a train encounters a beggar in this silent, absurdist play. 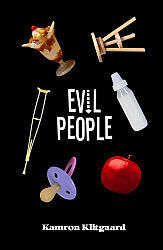 And in “Evil People,” seven people meet to define “evil” and to decide the fate of all “evil” people. Kamron Klitgaard is the author of several plays and has been a high school theatre teacher for more than a decade. Mr. Klitgaard lives with his wife Kathy; his three daughters Kortney, Katelynn, and Karlee; and his son Keaton in Utah.